FORT WORTH, Texas – He wasn’t packing a helmet and he declined several requests to reprise his signature back flip off a stage. 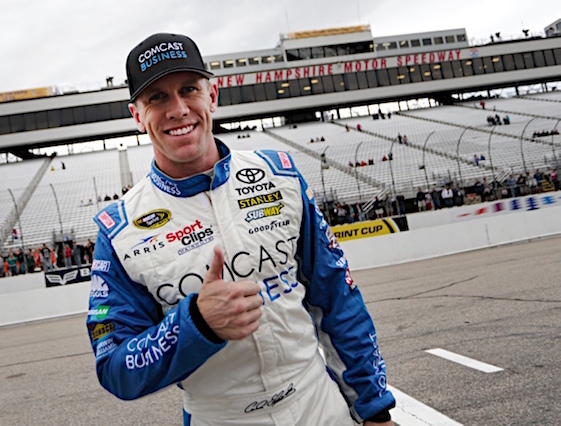 With that, retired NASCAR star Carl Edwards celebrated his induction into the Texas Motorsports Hall of Fame as 2017 classmate to popular IndyCar Series driver Helio Castroneves. Edwards and Castroneves became the 20th and 21st members of the TMHOF since the inaugural class in 2003 during induction ceremonies at The Speedway Club’s Grand Ballroom during the busy AAA Texas 500 NASCAR Playoff tripleheader last weekend. Edwards shocked NASCAR Nation when he unexpectedly announced his retirement from big-time stock car racing in January 2017. But the man who punctuated five of his six Cup victories at TMS with a back flip off the door of his race car was cheered as he entered the ballroom. Edwards made 24 NASCAR Cup Series starts at TMS from 2005 to 2016 and led 691 total laps around the 1.5-mile oval. Edwards, who rose to prominence driving Fords for Jack Roush at Roush Fenway Racing, exited the sport and the No. 19 Toyota Camry fielded by Joe Gibbs Racing. “Coach gave me an opportunity to step away when it was best for me, and that’s a gift I can never say enough about,” said Edwards, thanking Gibbs, a member of the Pro Football Hall of Fame. “Everyone has to make decisions in their life and I feel really fortunate to have people around me that facilitated my decision-making. Helped me think through things. For me, it was a really simple decision. If I didn’t care about money and I didn’t care what anyone else thought, what would I do? And the answer was really simple. I’d like to just step away for a while and focus on other things. And that’s as simple as it is. Edwards wasted little time finding his way to Victory Lane at Texas Motor Speedway, winning the Dickies 500 in just his second career start in what now is the Monster Energy NASCAR Cup Series in November 2005. Three years later, he became the first driver to sweep both Cup races in the same weekend at TMS, taking April’s Samsung 500 and November’s Dickies 500. And on Nov. 6, 2016 _ exactly 11 years after his first victory at TMS _ Edwards scored what turned out to be the final win of his Cup career in the rain-shortened AAA Texas 500. Inclement weather prevented Edwards from performing his celebratory back flip. Edwards also was a two-time winner at TMS in what now is the Xfinity Series, claiming the O’Reilly Auto Parts Challenge in November 2010 and the O’Reilly Auto Parts 300 in April 2011. Edwards said he has had no trouble dismissing “Silly Season” rumors about a possible fulltime return to the Cup grind. Edwards said he has had “a couple conversations with people” about racing again, but none in the last year or so. “I think everyone pretty much understands I’m not interested in coming back and doing anything too serious right now. It’s been off my radar for a long time,” Edwards said. “I feel like every day is a chance for you go to out and try to learn more about yourself, and see things in a different way. So for me this has been a huge change. The closest Edwards came to winning a Cup championship was in 2011 for car-owner Jack Roush. Edwards finished the season in a points deadlock with Tony Stewart, but lost the title on a tiebreaker decided by wins _ five for “Smoke” to one for “Cousin Carl.” In what proved to be the final start of his Cup career, Edwards’ bid for the 2016 championship ended when he was hooked by title rival Joey Logano on a restart with 10 laps to go at Homestead-Miami Speedway. Edwards said those near-misses _ most notably the 2016 finale _ do not haunt him. “There’s one simple fact and that is you can’t go back and change anything, that’s the way it is,” Edwards said. “Yes, I would love to be a two or three-time champion, I mean that’s what we work for. I think it’s not just time (that heals), I think it’s more life…the more I live, the more I see the real gift of racing to me was the day-in, day-out effort and the teamwork and the learning. I went from a guy…I was a much different person at the end of my career than I was at the beginning of my career and I feel like I was better. And I feel like racing made me that way. Edwards said he has made only two visits to a NASCAR racetrack since his retirement _ to the road-course in Sonoma, Calif., and to “The Great American Speedway” in North Texas. “I’ve always gone to the racetrack to look for something to drive or to race, so it’s hard for me to just go and watch. I like to race,” Edwards said. “I don’t follow it really, because if I’m so invested in it and it’s been so close to me I don’t think I can follow it without wanting to participate. It would be impossible for me. I try not to pay too much attention is the best way I can put it. I end up having all the same conversations, but if I’m going to follow it every week I might as well drive. Edwards gave a shout-out to Castroneves, winningest open-wheel driver in TMS history. Seated in the audience was Fort Worth’s Johnny Rutherford, a three-time Indianapolis 500 champion. Rutherford and Houston’s A.J. Foyt Jr., first four-time winner of the Indy 500, comprised the TMHOF’s first class in 2003. Castroneves, whose INDYCAR tenure with Team Penske ended after the 2017 season, owns TMS records for most wins (4), top-10s (15), top-fives (11) and laps-led (506) over the course of a record 20 career starts. Each of those victories was punctuated by his trademark front stretch fence-climb, a tradition that began after his first Indy car win at The Raceway at Belle Isle Park in Detroit in 2000 and prompted his “Spider Man” nickname. Castroneves also recorded one pole position around TMS’ 1.5-mile oval. Two years after a dramatic finish in the Chevy 500k in September 2002 as runnerup to Sam Hornish Jr. of Panther Racing by 0.0096-seconds _ the second-closest finish in TMS history _ Castroneves found his way into TMS’ Victory Lane in October 2004. Starting on pole, Castroneves led 104 laps and survived a late race charge from fellow-Brazilian Tony Kanaan of Andretti Green Racing to win the Chevy 500k. Castroneves became a multiple winner in Cowtown with a victory over Scott Dixon of Target Chip Ganassi Racing in the Bombardier Learjet 500k in June 2006. Castroneves joined Hornish as TMS’ only three-time winners with a victory over Penske teammate Ryan Briscoe in the Bombardier Learjet 550k June night race in 2009. Castroneves was crowned as INDYCAR’s winningest driver at TMS in June 2013. Helio dominated the Firestone 550 that summer night, leading 132 laps and finishing nearly five seconds ahead of runnerup Ryan Hunter-Reay of Andretti Autosport. Castroneves moved to Penske’s sports car organization for the 2018 IMSA WeatherTech SportsCar Championship after 18 successful open-wheel seasons, driving an Acura ARX-05 Prototype with Ricky Taylor. While committed to sports car racing, Castroneves will renew his quest for a record-tying fourth Indianapolis 500 win in next May’s 103rd edition of “The Greatest Spectacle in Racing” with Team Penske at Indianapolis Motor Speedway. The event marked the TMHOF’s first dual induction since native Texan Bobby Labonte, the 2000 Cup champion from Corpus Christi, and Speedway Motorsports Inc., founder O. Bruton Smith were recognized in 2008. It also was the Hall’s sixth dual induction overall. Fittingly, Edwards was honored during the same ceremony as Gibbs, his last team-owner, who received the Bruton Smith Legend Award for his leadership of a championship-winning organization. With more than 300 combined wins in the Cup and Xfinity series, Gibbs has solidified himself as one of NASCAR’s most successful owners. Cup title contender Kevin Harvick of Stewart-Haas Racing was honored with the 2017 Racer of the Year Award after a pair of strong finishes in April and a drought-ending victory in the fall Cup race. Harvick scored the first Cup Series victory of his career in Fort Worth during the ‘17 AAA Texas 500. Current NASCAR Xfinity title contender Christopher Bell, a native of Norman, Okla., received the 2017 TMS Sportsmanship Award. The Texas Motorsports Hall of Fame ceremony annually serves as a major fundraiser for Speedway Children’s Charities-Texas Chapter. SCC has invested over $10.6-million in the North Texas community to help children in need. In the 20-year existence of the local chapter, SCC has improved the lives of over 2.4-million children.